Active racer since 1994 with experience in road, TTs, and cyclocross. 10+ years bike shop experience, including bike fits. Former mechanic for 1-800-COLLECT pro women's team. JBV Coaching intern and powermeter user since 2009. 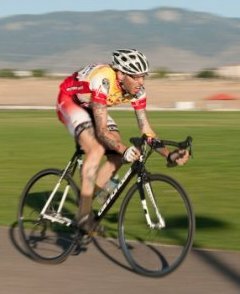 2011 New Mexico State Time Trial Champion. 2010 New Mexico Road Series overall winner. Has run multiple cyclocross clinics as head or assistant coach. Cyclocross coach to the Get Out! junior development team. Email Tom, or call him at (541) 609-8934. "Thanks so much for the clinic yesterday! I was so glad I attended, I learned a lot and am looking forward to putting my new-found strategy knowledge to use. As a beginner cyclist, you hear about strategy and it can be intimidating. This clinic was inspiring and a great mental boost. It is great knowing that I can go out there knowing what to expect and then some. "As a teammate and mentor for over 3 years, Tom has been integral in my success as a bike racer. His training and racing knowledge, leadership, and selflessness have helped me develop from a Cat 3 barely breaking the top ten, to earning consistent podium spots in the 1/2s within one year. I have also benefited from his bike fitting expertise, as he has greatly improved my TT position. Tom has a great head for the sport of cycling. He is a natural at preparing for and reading races. He is an excellent problem-solver when doing bike fits and fixing bikes. In addition, Tom’s humor and genuine kindness make him enjoyable to be around and provide a fun and comfortable coach-athlete relationship." 1st place, 2011 Sandia Crest Road Race, Pro 1-2.